Tomato sauce, melted cheese and savory meats are an ideal combination on pizza crust, so why not try them with pasta? 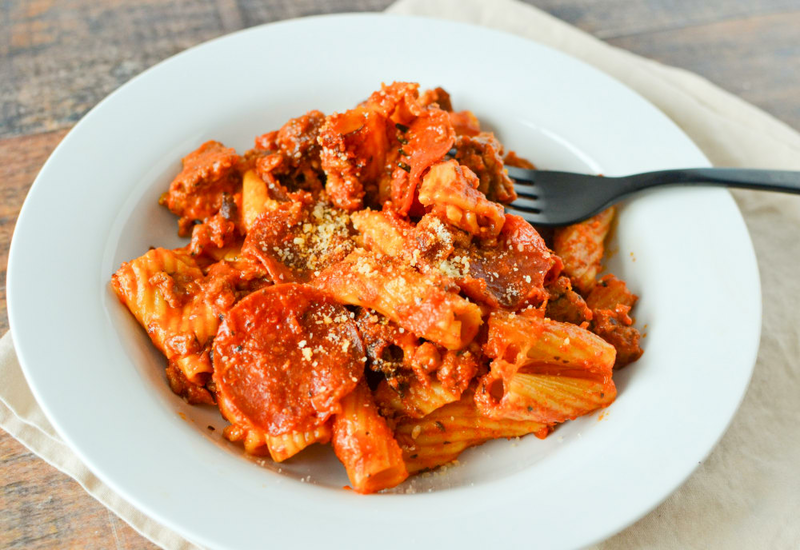 Our pizza pasta is a mixture of Italian sausage, pepperoni, and mozzarella cheese in a quick, homemade tomato sauce all served over a bed of thick rigatoni noodles. This best-of-both-worlds recipe is family friendly and ready to serve in 30 minutes. The simple sauce is seasoned with Italian herbs and ready in just 10 minutes, making this recipe a great option for busy weeknights and cool evenings when you're craving something comforting. You can also make this savory pasta vegetarian! Simply omit the sausage and pepperoni, and replace with 8 ounces of sliced mushrooms of your choice and cook as directed. You could also mix in steamed broccoli rabe or cubed zucchini to add more nutrients. Per Serving: 465 calories; 24g fat; 40.6g carbohydrates; 24g protein; 52mg cholesterol; 665mg sodium. My kids went crazy over this pizza-inspired pasta. I make spaghetti so much, I know they get tired of eating it all the time. This recipe was a great alternative for them, and really easy for me to make on busy weeknights. This is definitely a new favorite in the Scott household. This actually tasted like pizza, which was amazing. Can't go wrong with sausage and pepperoni either! Next time I will probably mix in bell peppers. I used mini pepperonis for this recipe, I thought the regular size pepperoni slices would be too big? I also used an Italian seasoning mix instead of the herbs and spices listed here. it tastes a lot like pizza, I'm just not sure I love all the carbs. This didn't turn out exactly how I anticipated. It had good flavor, but I think it needed more sauce. Next time I will probably used store-bought jarred sauce instead of the tomato paste mixture. I made this but with spaghetti noodles instead of penne, and added bell peppers for flavor. Better than regular spaghetti!